•Write a description of the item including brand, color, and number of pieces if the item has more than 1 piece. •Price (in whole dollar increments $2, $5, $10, $25 etc), on each tag. •ND means No Discount. If you put ND on your card, your item will not be sold at half-price. Sorting Numbers will begin with the Fall 2018 Childrens Consignment Sale. You will now see your ‘Sale Specific’ Sort # on the bottom of your tag. Your sort number will change every sale. Your Sort # is used to place your unsold items where they can be found for easy pick-up after the Sale. It is the Seller’s responsibility to check the Sort # to make sure they are using the correct Sort # for the upcoming Sale. To determine if the sort # is correct check the sale month & year above the sort number on the tag. If an incorrect sort # is used, unsold items will not be available for pick up and will be given to charity. Not all Sellers return to each season’s sale. 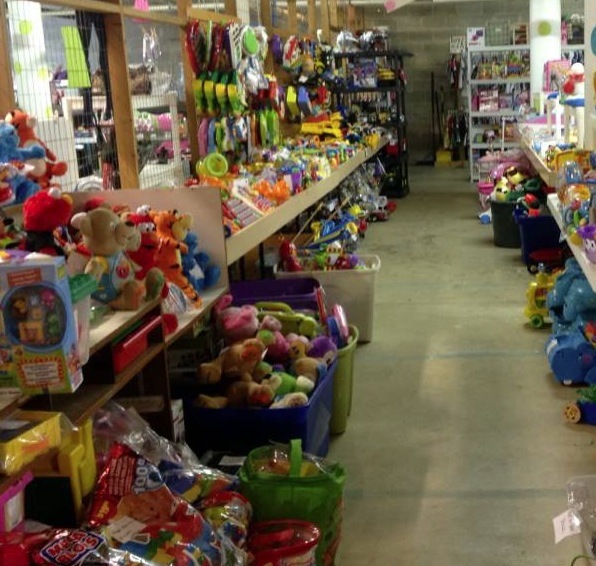 A separate Sort # allows our sorting of unsold items to use as few #’s as possible. Only registered Sellers present at any given sale have a Sort # for that sale. To Recap: Your Consignor # (above your barcode) will never change. This number is assigned to you when you first register as a Consignor with My Kids Attic and will remain yours forever. 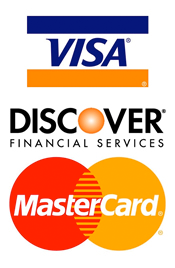 This number determines how you get paid. Your Sort # changes every sale (depending on when you register for the coming sale). Sort # is how we sort unsold items for pick up after the sale. It can be found at the bottom of your tags with the appropriate sale date. If you are selling an item previously tagged from a past Sale, you may print "Sort Number Labels" from your online account and simply place the "Sort Number Labels" over your old sort number at the bottom of your tags. Do not cover up your barcode with the sort label. 1. Go to the My Kids Attic Consignor login page located at mykidsattic.biz. 2. Use your consignor number and password to login. 3. Go to the "Register for this event" or "View your Registration Info tab. 4. Click the "Print Master Bar-Code Copy button. A pdf file will be created. 5. Use a laser printer to print your Master Bar-Code Copy. 6. 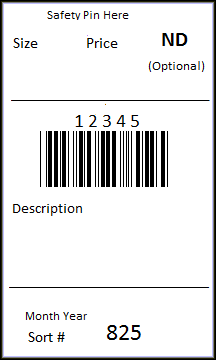 Make copies of your master barcode tag on 65 lb cardstock paper. 7. Do Not Use Copy Paper for your consignor tags! 4. Click the "Print Sort Number Labels" button. A pdf file will be created. 5. Print these peel off labels on Avery 5167 Compatible labels. 80 labels per sheet. Office Depot Brand labels are more economical. •Make sure your SAFETY PIN is pinned SECURELY! •Replace any missing buttons, zip all zippers, sew loose hems, snap snaps, tie all bows and make sure that all garments are presented at their best or please don't bring them. •Remove all stains and launder garments. An iron and a little starch can work wonders to make an item look like brand new. •All clothing items must be hung on plastic or wire hangers. Please use size appropriate hangers for your items. With the volume of clothing on the racks, if the hanger is too small, the item will fall onto the floor and will not be seen to sell. You may use adult wire hangers too. •Group and rubberband clothing items by size and gender for check-in. •Sets tend to sell better. Pin sets securely together by hanging the shirt first on the hanger as outlined above. Turn around and pin the second item "back to back" - making sure to catch the hanger with the safety pin. •If grouping multiple items, tape the hangers together using clear packing tape or rubberband together. •If an item is not secure on the hanger, safety pin it to the hanger. This is easier to achieve on wire hangers. 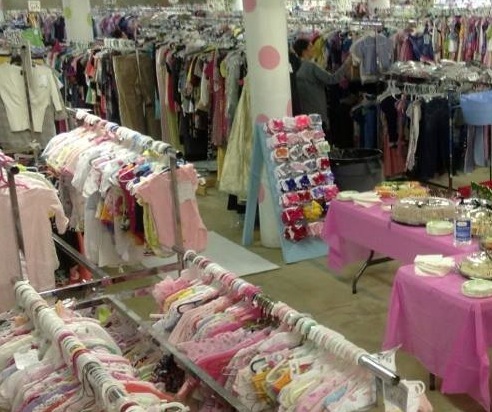 Items do not sell if they have fallen under the racks or if they lose their tag. •Small accessories that go with an outfit, such as tights, belts, and hair bows, can be placed in a zip-loc bag and pinned to the back of the hanger. Make sure the tag description includes the accessory items and that your Consignor number has been placed in or taped to the accessory bag. •Infant sleepers, gowns, onesies and sacks do not have to be on hangers. They are placed in bins and may be sold in multiples, if you would like, by simply pinning them together at the shoulders. (Please do not put them in Ziploc bags as shoppers want to be able to look at them) You may bring as many of these items as you would like, even in the 0-6 months range. •Take time to clean! It's amazing what a toothbrush can do with small crevices. All fabric parts should be freshly washed and reattached. Wipe down all surfaces. Goo Gone and Magic Erasers work well on crayon marks and scuffs. 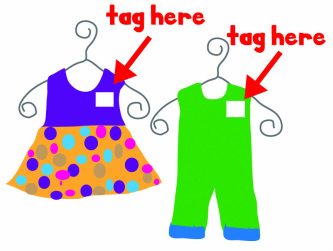 •Attach tag to toy with clear packing tape or place small toys in a zip-loc bag and attach tag to the outside of the bag. •Games and puzzles must have all pieces and boxes must be taped closed with clear packing tape. •Books can be grouped together or sold separately. Place grouped books in a zip-loc bag and attach tag to outside of the bag with a strip of clear packing tape across the top of the tag; or secure books with rubber bands running both horizontally and vertically (+) and tape tag to the back of books. Make sure tag description references the number of books included. •If it needs a battery, make sure it is included!! Dollar General batteries are fine. If possible, tape the tag to the game - packing tape works best. If the electronic game has many pieces or comes with game cartridges, place those pieces inside a Ziploc bag and tape or zip-tie the bag to the game. Remember to describe all the pieces included in the set on the tag's description. Tape the tag to the outside cover of books or videos. Make sure the video matches the case. To combine multiple videos to sell as a set, tape all of them together, or put the set in Ziplock bag, fold over and tape bag closed and tape your tag to the outside. On large items, tape the tag to the item for easy viewing and removal. If the item includes extra parts, please secure them in a large clear bag or ziploc bag, attach them securely with packing tape or zip-ties, and make note of them in the item's tag description. On Power Wheels, please place the power cord in a Ziploc bag and securely zip-tie it to the vehicle when you drop it off. Place masking tape with your consignor number on the bottom or underneath each large item. This helps identify your item in case the tag becomes lost. •Place loose items, such as feeding utensils, army men, or bottles in a zip-loc bag with tag attached to outside of the bag with clear packing tape. separated and to help prevent theft. then through the pair of shoes before securing/closing zip-tie together. This way it will only take ONE zip-tie for each pair of shoes. **Zip-ties can be purchased at Walmart, Harbor Freights or Lowes. The smaller ones work well for shoes. •Place in a clear bedding bag, preferably the original packaging. If this in not available, we recommend the new XL and XXL sized Ziploc bags. Attach tag using clear packing tape to the outside of bag. IMPORTANT: Write your Consignor number on a small piece of masking tape and tape to the inside label of your clothing items or to a flat surface of every other item. For small items placed inside zip-loc bags, tape a piece of masking tape with consignor number to the inside of the bag. This is one additional way to identify who an item belongs to in the event a tag is misplaced or lost or items are removed from bags. •Safety Pins need to be secure on the item so the tag does not fall off. •For items packaged in zip-loc bags, seal the bag with tape to ensure that a contents of the bag are not removed or spilled out. it interferes with the scanner. •Use a Laser Printer to print your Master Tag. •Use "normal" setting when printing your tags. •Make sure your barcodes are crisp and that you can see white in between the black lines. •Use ONLY cardstock paper as thin tags rip, fall off, and get lost!